When you search for a photo of Halo Top on the Associated Press image wire, the first result is of a SpaceX test rocket sailing off towards the infinite expanse of outer space. A halo surrounds its glans, or whatever you call the tip of a rocket, probably due to some combination of atmospheric moisture, low temperature, and high speed. Though not the image of ice cream I was hoping for (the AP often has nice shots of brands on grocery store shelves), there is something sort of poetic about finding this one instead. Here is an object sailing at an incredible rate of speed in a desperate attempt to free itself from our planet’s relentless gravitational pull. That’s sort of how I feel when thinking about Halo Top “ice cream,” you know? It makes me want to leave Earth. My first experience with Halo Top “ice cream” occurred this week, when I felt the sudden urge for a weeknight dessert after realizing I’d accidentally gone several weeks without a enjoying a post-meal sweet treat. While in the ice cream section of my local grocery store, I noticed the brand’s very good packaging and—after remembering that a friend had recently shared how much they like it—decided to give it a try. 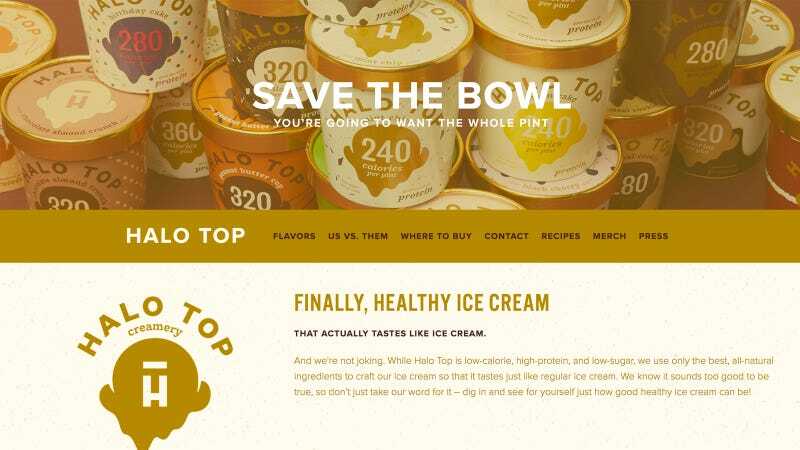 While standing in the empty aisle, I googled “BEST HALO TOP FLAVORS” and found a seemingly reputable site that said the clear winner was mint chocolate chip. So I, a fan of regular mint chocolate chip ice cream, bought a pint of mint chocolate chip Halo Top “ice cream.” At first I felt odd about approaching the cashier with nothing but a pint of Halo Top, but then I noticed the person behind me was buying nothing but a sea salt grinder and realized everyone is on their own journey. Once home, I turned on Ken Burns’s The Civil War—which I haven’t watched in full since the ’90s—and opened my “ice cream.” Turns out, “Ashokan Farewell,” the almost jarringly beautiful melody that acts as the documentary’s main theme, is a perfect complement to the experience of eating Halo Top for the first time. Composed in 1982 “as a goodnight or farewell waltz at the annual Ashokan Fiddle & Dance Camps,” the song made me wistful for the times I was eating something better—like, oh, Ben & Jerry’s Americone Dream. Halo Top, with its strange combination of milk, cream, eggs, erythritol, prebiotic fiber, milk protein concentrate, organic cane sugar and vegetable glycerin, is more ice than cream, and more dessert substitute than actual dessert. Image via Karlie Kloss’s Instagram. Is it bad? Not necessarily. It’s just...not ice cream. It has a texture unlike anything I’ve ever experienced—like ice blended with a lot of fake sugar and something vaguely milk-like—and makes you feel like you’ve done something wrong immediately after finishing the pint (which is what you’re supposed to do, per its aggressive branding). In the future, I’d much rather eat a little Ben & Jerry’s than an entire pint of Halo Top. Celebrities like Karlie Kloss may fill their freezers with it, but my coworkers are—for the most part—less than impressed. What do you think about Halo Top? Do you like it? Do you hate it? Do you merely tolerate it? Do you...fear it? Let me know. Halo Top makes people passionate.